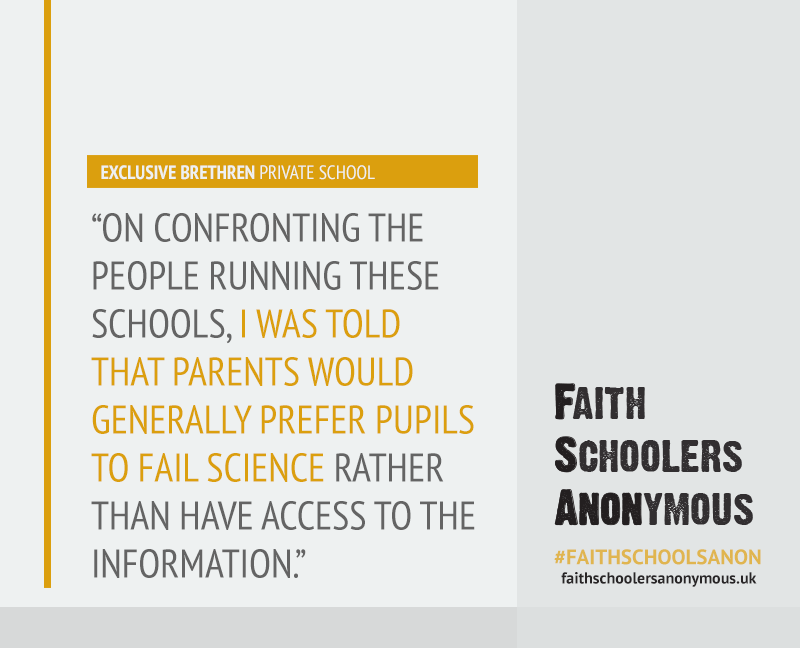 As a modern orthodox family we sent our daughter to a Jewish secondary state school where many (most) of the pupils come from modern orthodox families. It wasn’t our first choice of school but she didn’t get a place at the higher ranked schools. Whilst the secular education in the school is of a very high standard, the school’s ethos, fairly openly, promotes aspects of Ultra Orthodox ideology. This is a school which has an outstanding Ofsted grade, however even in 2016 it teaches a different Jewish studies curriculum to boys and girls (who are taught in separate sites although legally it’s one school). 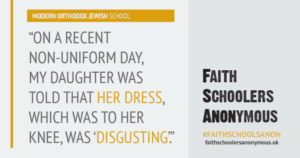 This fact is openly advertised on the school’s website, and is because Ultra Orthodox Judaism believes that girls / women should not study the Oral Law (Talmud). Other problematic themes surround the issue of girls and gender difference, and an obsession with “modesty”. Whereas both parents are allowed to watch boys perform at school shows, only female only audiences are permitted for girls’ school shows, even if these don’t entail singing at the girls’ school. 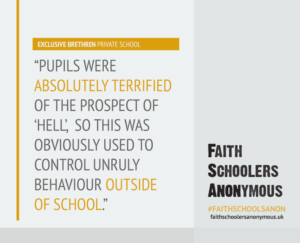 Also there is an obsession with dress code and skirt length, the school has employed someone to enforce skirt length to ensure that skirts cover the girls’ knees at all times, and emails are regularly sent to parents reminding them to check the length of the girls’ skirts. Further, whilst boys can wear short sleeve t-shirts, girls must cover their elbows at all times. 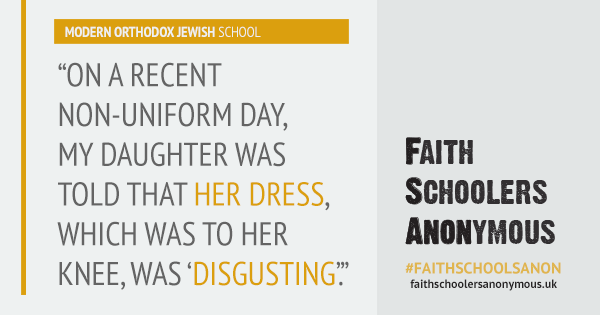 On a recent non-uniform day, my daughter was told that her dress which was to her knee was “disgusting”. When the school teaches “holocho” or Jewish law, it teaches the Charedi / Ultra Orthodox interpretation rather than the (often more lenient) modern orthodox interpretation, even though most of the families in the school would self identify as modern orthodox. This is because the parent body has changed over time, but the ethos and Rabbinical leadership has not changed. 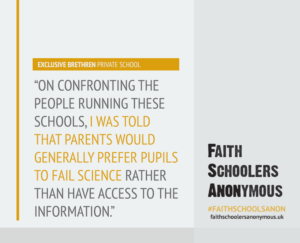 It is time that parents should be able to alter the ethos of faith schools as the demographic need changes; ultra Orthodox families generally would no longer wish to attend this school as they have moved further to the right and have eschewed secular education. 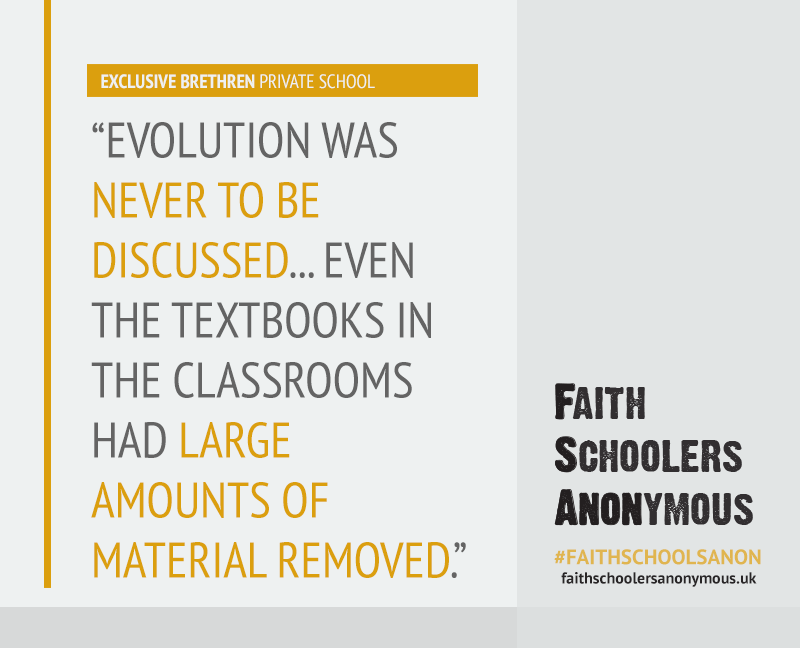 The education on offer can be quite alienating as pupils feel that the ideology promoted is at odds with their more liberal faith values.